Harrison Consoles have released their AVA Multiband Compressor, the latest of their outstanding modules derived from their legendary large format mixing consoles. If you are looking for a multiband compressor, this is the one to get. 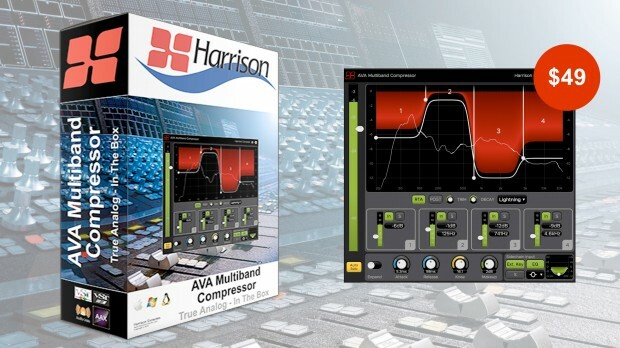 Get Harrison Consoles AVA Multiband Compressor Here ! The AVA Multiband Compressor is the latest implementation of Harrison’s renowned Multiband Compression algorithm, as used in ultra high-end post & film facilities worldwide. Now in the fourth generation, the Harrison Multiband Compression algorithm has been continuously tweaked by their customers in high-end music, film, broadcast, and video-post production. Harrison’s reputation for “True Analog In-The-Box” sound is due to our unique development heritage: they first created an analog console processor and then converted the processor to digital while retaining the sound and character of the original analog console. This entry was posted in DontCrack, Plug-ins, Promotions and tagged AVA Multiband Compressor, Harrison Consoles, Multi-channel Multiband Compressor, multiband compressor, sidechain. Bookmark the permalink.